On the occasion of the review of Vietnam under the Universal Periodic Review, the Khmer Kampuchea Krom Federation held a demonstration in front of the United Nations before joining the session inside. On 5 February 2014 the human rights record of Vietnam was examined during the 18th session of the Human Rights Council Universal Periodic Review Working Group at the Palais des Nations in Geneva, Switzerland. With the support of UNPO, our Khmer Krom Member used this opportunity to hold a large demonstration in front of the United Nations and to send a delegation to attend the session. The Universal Periodic Review is a mechanism of the Human Rights Council that was established by HRC resolution 5/1 on 18 June 2007 and held its inaugural session in April 2008. It consists of the review of the human rights practices of all United Nations (UN) Member States, once every four years and a half. The review is based on the reports provided by the State under review, stakeholders’ reports submitted by NGOs and other relevant bodies, as well as a compilation of UN information. This information is then discussed during a constructive dialogue between the States, NGOs being only able to speak in the last phase of the UPR. The review of Vietnam came at a tense moment, since a few days before the former Vietnamese consul to Geneva, Mr. Dang Xuong Hung, applied for asylum in Switzerland, denouncing the actions of the government to cover up its poor human rights record. He specifically urged the members of the Vietnamese mission to the UN to “speak the truth” about the violations committed by Vietnam. 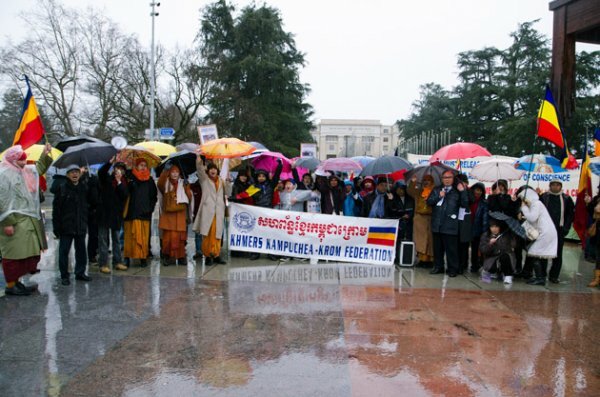 In order to highlight the issues facing the Khmer Krom community in Vietnam, the Khmer Kampuchea Krom Federation (KKF) started the day by holding a demonstration in front of the Palais des Nations. In spite of the pouring rain, more than 250 people were gathered on the square, chanting slogans and holding placards asking Vietnam to release Khmer Krom prisoners of conscience and to respect Khmer Krom basic rights, especially the right to a true Theravada Buddhism. They also used this opportunity to gather signatures in support of a motion that was later submitted to UN High Commissioner for Human Rights Ms. Navi Pillay. The letter included extensive facts about human rights violations in Vietnam, as well as recommendations on how to improve the general situation. A delegation of the KKF along with a UNPO representative then went inside the UN building to attend the session. The session was opened by Mr. Baudelaire Ndong Ella, President of the Human Rights Council, followed by an introductory speech by the Vice-Minister of Foreign Affairs of Vietnam H.E. Ha Kim Ngoc, who ignored the issue of political prisoners and claimed that Vietnam was respectful of religious rights. 104 States then took the floor, focusing mostly on issues relating to the death penalty, political prisoners, the signature and ratification of international human rights instruments, the creation of a National Human Rights Institution in accordance with the Paris principles, the development gap between rural and urban areas, the plight of ethnic minorities in Vietnam as well as respect for freedom of assembly and freedom of expression, most particularly online. The report to the review of Vietnam has been compiled by Kenya, Kazakhstan and Costa Rica, and is available for download in the right column. The video of the main session is available here. The video of the adoption of the report on Vietnam is available here. The stakeholders’ reports by UNPO and the KKF, the letter sent to Ms. Pillay, as well as the address by the Vietnamese Vice-Minister of Foreign Affairs are all available for download in the right column. All other documents related to this session are available here.